As a result of a number of recent researcher visits to the MAL, the question we’ve been mulling over lately is whether, or how, works of digital literature can be said to have “manuscript versions.” Here is the background to this question: on 7 June 2012, I blogged about the 5.25″ floppies of bpNichol’s “First Screening” that had been donated to the lab by Canadian poet Lionel Kearns. The Media Archaeology Lab at the University of Colorado, Boulder has two 5 ¼-inch floppies with incomplete versions of First Screening on them (along with the requisite Apple IIe for viewing them). These beta-phase versions of First Screening not only differ from each other and from the published version (which is available online as an emulation of the software running on an Apple IIe) in content, but also in metadata. The two disks contain different selections from the eventual First Screening line up and this variation in primary text content affects the underlying layers of text that are intrinsically tied to the properties of the software. For example, typing the CAT command for catalogue of disk contents brings up a list of programs on each disk and the amount of space occupied by each. While one disk indicates that the poems claim 013 sectors of space on the floppy, the other—which has more of the final selection of poems—requires 045 sectors of space for the First Screening program. Additionally, by entering the command GOSUB 500 on the latter disk brings the user to the dedication at the end of the poems, while executing the same command on the disk with less poems calls up the piece “Tidal Pool.” The message that greets readers when the disk is first booted up and prompts them to type the RUN command claims its own 002 sectors of space and appears as a program titled “Hello” when the CAT or LIST commands are executed. 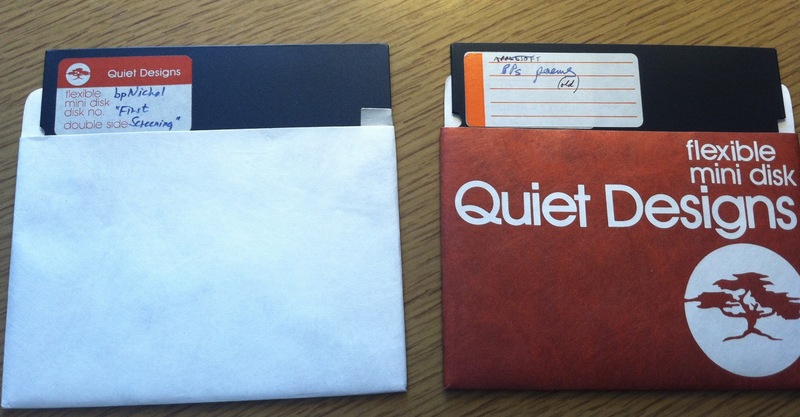 The metadata also confirms that these two floppies are not complete versions. A quick consult with the Apple IIe manual reveals that the lack of asterisk beside the list of programs recalled with the CAT command means that these programs are unlocked and open for edits from any user. When First Screening was translated from Applesoft Basic to HyperTalk programming language it was published on a different size of floppy disk, it became viewable on a whole new range of personal computers, and the underlying layers of text behind the viewing text transformed. The programs on the disk that execute the poems are measured in new units, and the commands that call up metadata have changed. In fact, the viewer’s ability to communicate directly with the program through simple command lines is impeded by the presence of a user menu that requires the viewer to communicate with the program by selecting options with the cursor instead. The cursor function builds up the layers of text (in this case HyperTalk coding language) between the viewing text and the initial text that was input by the author. Now the placement of the cursor in the table of contents initiates a command sequence instead of the user perusing the location of individual poems with the LIST command and manually entering a GOSUB command to jump ahead to a specific poem in the sequence. Nichol was aware of the subtleties of these layers of text and how they were dependent upon their medium. A text file (provided by Jim Andrews and co.) of Nichol’s original First Screening created with Applesoft Basic reveals that Nichol imbedded a bonus poem in the programming language. Using the REM command as a prefix he created a poem about the biblical flood that includes word play such as “REM ark.” In the Basic language REM indicates a line of text in the code that will not be executed as part of the program and is only visible when the code is being read in its raw form. Like the HTML of today’s use of the forward slash and the asterisk, REM preceded lines within code that were essentially references for the programmer. In Nichol’s hidden poem, “ark” is the primary text, but “REM” couples with it to form a larger word that is a hybrid of command and content. Since REM is not a command in HyperTalk, Hohm must include this poem as a bonus feature that is purely content, thereby losing the play-on words and an integral part of the poem’s identity. Below are photographs Wooler took of the Hypercard version of “First Screening” housed in the Media Archaeology Lab as well as the lab’s still functioning Macintosh Powerbook 160 from 1992.